Unless someone has specifically pointed this out, you may not be unaware of the importance of rating your perceived exertion when you exercise. This measures the intensity of your exercise and how hard your body is actually working when you exercise. It is used in research studies for that exact purpose and training programs also use it to describe the intensity level of the training sessions. When you are exercising, it is important that you learn to monitor your intensity level…your degree of effort used in order to make sure you are working at a pace that is challenging enough to help you reach your goals but not so hard that you hurt yourself. Proper exercise programs must challenge the body over and beyond what it experiences on a daily basis when performing physical tasks and activities. Exercise that does not produce enough muscular fatigue will not stimulate muscular growth. 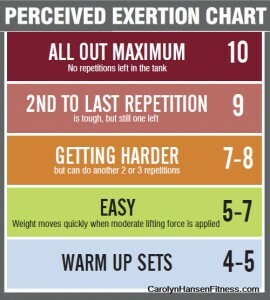 One way to do that is to use a Rate of Perceived Exertion Chart. Rate of Perceived Exertion or RPE is sort of a self-check mechanism used to help you maintain awareness of your level of workout effort. This allows you to work at your own pace, and capabilities regardless of your current fitness or strength levels. 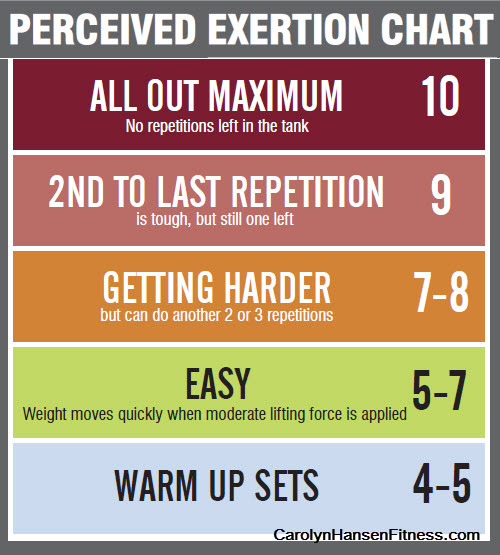 RPE (Rate of Perceived Exertion) is a scale running from 1-10 that helps you be aware of how hard you are or are not exercising so that you can reach your fitness and weight loss goals in the quickest way possible. It uses information from both the internal and external environment of the body to make a subjective assessment of physical exertion. At “O” you would essentially be sitting in a chair and not moving much at all. It is a subjective self-measure of your own work output based on how hard any given exercise feels to you at a given time. Level 1 would read as a “light level” of RPE while at level 3 your RPE would be at the moderate level. For the most part, you want your workouts to be around level 5-6. With interval training your recovery should be around 3-4 and your intensity blast to be at around 8-9. Working at level 10 is not recommended for most workouts. For longer and slower workouts, keep your RPE at Level 5 or lower. Looking at the scale above, a warm up set will be at the 5-7 (easy) level while your first working set may be in the 7-8 level and the last set may be at the 9 level. Sticking to this type of intensity level ensures you get the results in the quickest manner. Pay attention to the rating scale while working out and focus on your total feeling of exertion. Then choose the number that corresponds with your level of exertion. Because you are doing a self-evaluation you must evaluate the feeling of exertion you experience as honestly as you can.